There's a new suspect, who has his hands on Nipsey Hussle Shootings to death. 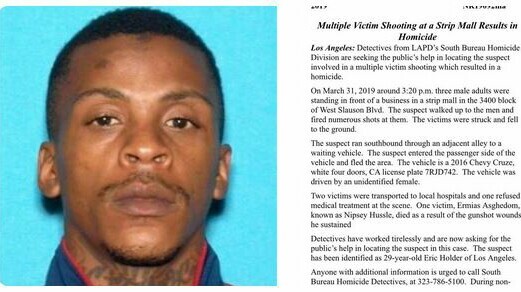 Eric Holder, the man responsible for the death of Nipsey is missing for his arrest after his beyond misdemeanor. 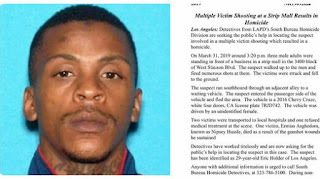 The 29 years old Eric Holder reside in Los Angeles and his felony is on the heel of getting him arrested meanwhile L.A police is searching for him on blue light with no desperation of losing him. Source told Amahiphop that both gender Eric and Hussle has earlier engaging on altercation before the rapper was gun down in front of his Marathon Clothing store. Holder was last seen in a white, four-door 2016 Chevy Cruze, with the license plate number 7RJD742. Detectives had earlier said that they believe the shooter was someone Nipsey knew. L.A police is strictly looking for Eric and the department police has gave us contact (323-786-5100.) to reach out for more information about the missing convict.